This freezer-friendly soup is great to make in batches, and is best cooked using veggies at their freshest. It will flood your system with easily digestible nutrients along with the fibre you need to feed a healthy bacterial colony. 1. Melt the oil or ghee in a large saucepan over medium heat. Add the leek, onion, garlic, celery and ginger and cook, stirring regularly, for 5 minutes or until lightly browned. 2. Stir in the tomato paste and chopped tomatoes, then cook for a further 1–2 minutes. Add the beans, cauliflower, zucchini, capsicums, kale and spinach, then cook, stirring frequently, for a further 1–2 minutes. 3. Add the stock or water and, if necessary, extra filtered water to cover the vegetables. Bring to the boil, then reduce the heat to low and simmer for 10–15 minutes or until the vegetables are tender. Add the herbs and stir to combine. 4. Remove from the heat and allow to cool slightly, then purée in a food processor or blender to your desired consistency. 5. Serve hot, sprinkled with black pepper, yeast flakes, if using, and watercress. 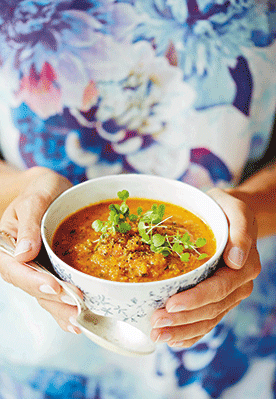 Recipe taken from Heal Your Gut by Lee Holmes (Murdoch Books, £14.99). Photography by Cath Muscat.